The history of Christianity in India from the time of St.Thomas, the doubting disciple of Jesus Christ in 52 A.D.to the arrival of Vasco de Gama, from Portugal who came to South India in 1498 A.D. is the same. There was only one Christian Church receiving bishops from the Persian Church. It is known by nickname Nestorian Church. The Chaldean Syrian Church in Trichur, also known as Church of the East or the Nestorian Church is the faithful remnant of the pre-Portuguese Syrian Christianity in India. This small community based in Trichur uses the same faith which was practiced when the Portuguese arrived in India in 1498 AD. It has much in common with the Syro Malabar community, using the liturgy of Mar Addai and Mar Mari. After the attack of Tippu Sultan in the second half of the 18th century, the famous Shakthan Thampuran of the erstwhile Cochin state decided to improve the commerce of his state by developing Trichur town. In 1796 he brought 52 Christian families from the neighbourhood of Trichur to improve the trade in Trichur. . In 1814 A.D. the Mart Mariam Big church was built in Trichur for the worship of the Chaldean Syrians from Ollur, Aranatukara, Kottekad, Arimbur etc. brought by Shakthan Thampuran, ruler of Cochin state for the progress of commerce in Cochin State. In 1815 Palayil Abraham Kathanar dedicated this church by the command of Sri Kerala Varma, the Maharaja of Cochin. The famous Rama Varma known as Shakthan Thampuran who brought the Christians to Trichur.died in 1805 AD. His successor Rama Varma died in 1808 AD. Sri Kerala Varma Maharajah was his successor. It was this Maharajah who gave the theetooram (royal order) to Palayal Abraham Kathanar. The first bishop to come to Mart Mariam Church in Trichur after its construction in 1814 A.D was Mar Thoma Roccos Metropolitan sent by Patriarch Mar Joseph Audo in 1861 A.D. Mar Thoma Roccos was sent to India by the request of the Syrian Christians in Kerala through Fr. Antony Thondanatta. Fr.Antony went to Mosul along with Fr. Antony Kudakachira who died during that journey.. Mar Rokos who arrived in Trichur in 1861 was received by many parishes like Trichur, Ollur, Aranatukara etc. But he was sent away in 1862 by the Catholics under the leadership of the Blessed Chavara Kuriakose Elias, founder of the CMI congregation. In 1862 AD Fr. Antony Thondanatta went to Mosul in the same boat in which Mar Thoma Rokos was returning from Malabar to Mosul. Fr. Thondanatta did not get any positive response from the Chaldean Catholic Patriarch of Mosul Mar Joseph Audo. So he proceeded to Kochanes in Kurdistan. The Nestorian Patriarch Mar Ruwel Shimun (1862-1903 AD) consecrated him Metropolitan of India. Although he returned to his native Travancore state in 1863 he could not function as Metropolitan, as his followers had become Roman Catholics. He was forced to remain a priest in Catholic Church in Vilakumadom near Palai after shaving off his beard. After 1874 he moved to Trichur as Vicar General to Mar Elia Mellus Metropolitan. When Elia Mellus returned to Mesopotamia in 1882 Thondanatta moved to Elamthottam near Palai. After his defeat in the church litigations in Elamthottam he returned to Trichur in 1897 or 98 and died on 16 November 1900. He is buried inside the altar of the Mart Mariam Cathedral, Trichur. His remains were transferred in 1954 to the chapel in the southern side of the Church near the tomb of his successor Mar Abimalek Timotheus Metropolitan. Mar Abimalek Timotheus born in Mar Bhisho village near in the border of Turkey and Iran on 28 August 1878 was made deacon in 1903 and priest and Archdeacon on 1904. He was consecrated Metropolitan on 13 December 1907. He arrived in Trichur on 27 February 1908. He died on 30 April 1945. Mar Abimalek Timotheus was very famous. Jawaharlal Nehru during his first visit to Trichur on May 29, 1931 came to meet Mar Timotheus along with his wife Kamala and daughter Indira who later became the Prime Minister of India like her father. Jawaharlal Nehru wrote about this visit in his book An Autobiography. He was the friend of the Maharajah of Cochin as well as the British Resident to Travancore & Cochin states. Even now his tomb is visited by Christians and Hindus. 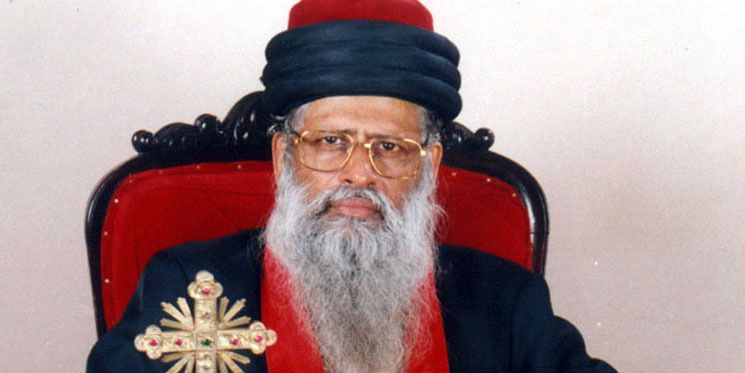 After 7 years and 2 months after the death of Mar Timotheus, Mar Thoma Darmo Metropolitan arrived on 20 June 1952. Mansur Elisha Darmo was born on 21 September 1904 in Eil near in Southern Turkey. He was ordained a deacon by Mar Abimalek Timotheus Metropolitan of India when he visited the Baquba (near Baghdad) refugee camp of Assyrians in 1921. He served a deacon in Khabour, Syria till 1951 when he was chosen by Mar Yosip Khananisho Metropolitan in Iraq and Mar Eshai Shimun Patriarch to be Metropolitan of India. Mar Thoma Darmo Metropolitan worked in India from June 20, 1952 to September 7, 1968. During this period many churches, parsonages, shop rooms, Seminary, Mar Timotheus Memorial Orphanage etc. were built. He ordained many clergy and sent some for theological education in other Seminaries. Printing of Hudra in 3 volumes is his major achievement. There was a split between him and his consecrator Patriarch Mar Eshai Shimun who suspended the Metropolitan on 10 January 1964. The issue was the hereditary succession of the bishops and Patriarchs. The patriarchate was in the Mar Shimun family since the middle of the 15th century, about hundred years before the major split under monk John Sulaqa in 1553. In March 1964 Patriarch Mar Eshai Shimun issued a universal order adopting Gregorian calendar beginning with Advent 1964. Thus the followers of Mar Shimun had two Christmases in 1964. The calendar issue continues to be an issue in the Assyrian Church outside India. Mar Thoma Darmo Metropolitan consecrated two Indian priests in Baghdad in September 1968. Mar Poulose Episcopa and Mar Aprem Metropolitan. Mar Poulose was on his way to study in USA. In October 1968 Mar Aprem Metropolitan after a stay of 6 weeks in Baghdad returned to India. He began to give leadership to the group called Metran Group. Fr. Antony Chakola gave leadership to the opposite group known as Bawai Group. The civil suits continued. Poulose Mar Poulose Episcopa arrived in India on 1 January 1976 after his Th.D. studies in USA. He died on 24 March 1998. He was well known for his activities in favour of the poor. He was Chairman of WSCF ( WORLD STUDENT CHRISTIAN FEDERATION) in Geneva. After long litigations and negotiations both groups were united in November 1995 under the headship of His Holiness Catholicos Patriarch Mar Dinkha IV who is temporarily residing in Chicago. The Church of the East known as the Chaldean Syrian Church based in Trichur has only 30 thousand members out of the estimated 7 and a half million Syrian Christians (or Christians of St. Thomas) of India. The world population of this Church under Catholicos Patriarch Mar Dinkha IV is around 4 lakhs. In India this Church has 30 parishes and 75 clergy (54 priests, 21 deacons). There are 3 nuns and 3 deaconesses. In 2005 Mar Aprem Metropolitan inaugurated a Gulf parish in UAE and Qatar. It is now worshipping every Friday morning in St. Philip’s Chapel in the St. Martin Anglican Church in Sharjah. There are two young priests from Trichur doing part time priestly duties. In addition to the members of our Church from Trichur, we have members of the Assyrian Church from Iraq, Iran, Syrian, Lebanon working in UAE attend these services. Mar Timotheus memorial Orphanage started in 1962 in Kalathode, Trichur is taking care of about 70 boys and girls from Muslim, Hindu and Christian communities. The Mar Timotheus Charitable Society (Hospital & Santhosham Home for the Aged) is doing humble work in that field. This Church has a Seminary in Mulangunnathukavu (10 kilometers from Trichur) started in 1956. This Church is a member of Kerala Council of Churches, the National Council of Churches, CASA (Church’s Auxiliary for Social Action, Delhi, Christian Medical College, Vellore. After The Unity of two Calendar Groups under Catholicos Patriarch Mar Dinkha IV in November 1995 this Church is making good progress in many fields.